The ceiling tiles were the first to go. Then the windows. The floor and walls took a beating, too. “We had this great basement for floor hockey,” John Pohl said. “My dad called it the rec room. But it was really the w-r-e-c-k room. We definitely beat that basement up. The four Pohl boys are separated by five years. To keep those Pohl vs. Pohl showdowns competitive, John, the oldest, always was paired with Tom, the youngest. The two middle boys, Mark and Mike, formed the other team. “They would come home from a game, sit down and eat some pizza, then they would go downstairs and play the game over again,” dad Jim Pohl said. “There would be some real battles. 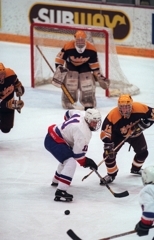 Jim Pohl played high school hockey at Cretin and in college at Saint Mary’s University. He taught his boys the fundamentals as their youth coach. Those endless 2-on-2 games ingrained elements of competitiveness and toughness. As it turned out, the Pohls were impeccably groomed for high school competition. John’s playmaking and scoring feats are legendary. He set an unthinkable standard, amassing a stunning 378 career points during a four-year career that included a state Class 1A championship to culminate an undefeated 1996-97 season. Pohl’s point total ranks second in state history behind the 405 posted by 2009 Little Falls graduate Ben Hanowski. Pohl’s 234 career assists are the most in state history. Dave Spehar of Duluth East is the only other player in state history to have scored more than 300 points. One of the most infamous moments in Pohl’s career came in a game against Shakopee. With the Wingers holding a comfortable lead, Pohl found himself on a breakaway. Leading up to the game, the 6-foot, 180-pound Pohl had been messing around in practice with various trick shots, including one in which he dropped his stick between his legs and leveraged a shot into the upper corner. “Honestly, you don’t even think about something like that,” said Pohl, who successfully executed the move against the Sabres, then spent the rest of the game watching from the bench. “It just happened." Loiselle knew Pohl’s intention wasn’t to embarrass the Sabres. Former Red Wing coach George Nemanich, although impressed by Pohl’s creativity, had seen enough. “It was a really neat move,” Nemanich said. “I thought it was probably rubbing salt in the wound at that point. He knew right away after he did it that it was wrong. 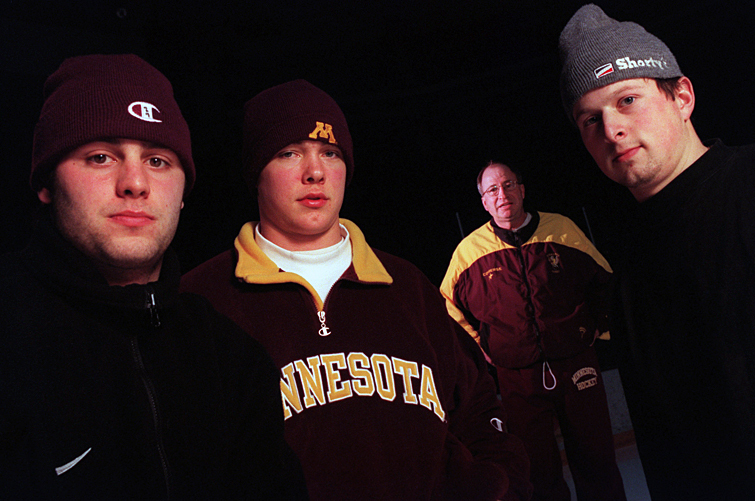 Pohl, Tom Moore and Seth Larson formed one of the highest scoring lines in state history. Pohl’s uncanny ice vision and passing ability served as the perfect complement to Moore, who possessed a deadly shot. The elusive Larson added an element of quickness to the trio. John Pohl, who played in four state tournaments, was a junior in 1997 when Red Wing became just the second southern Minnesota school to win a state title. The Wingers outlasted Breck 5-4 in the quarterfinals and pounded Fergus Falls 4-1 in the semifinals to earn a matchup with defending champion Warroad in the title game. Pohl had a goal and an assist in the first period as Red Wing took a 3-0 lead. Warroad scored the only two goals of the second period, and the Wingers eventually held on for a 4-3 triumph. “If you take our Squirt A picture and compare it to our state championship team picture, it was essentially the same group of guys,” Pohl said. “It was the same group of core friends. I don’t really remember many games or many goals or anything, but I do remember being with my friends and all the crazy stuff we would do. Camaraderie was built during long bus rides to games in Hastings, Cottage Grove and Woodbury, among other southeast metro locales. Home games were the hottest ticket in Red Wing. The Wingers’ arena typically was packed long before the start of the varsity game. It was part of the game night routine to lock the front doors and affix them with “Sold Out” signs. Red Wing finished in third place at the 1998 state tournament, when Pohl was named to the all-tournament team for the third straight year. That spring he was named Mr. Hockey. Pohl holds the state tournament career record for assists with 17. His 28 state tournament points ties him with Hankowski for third on the all-time list. 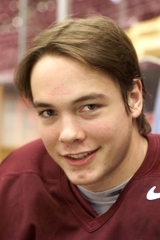 Pohl scored 71 goals and had 200 points in four seasons at the University of Minnesota, where he was captain of the Gophers’ 2002 national championship team. 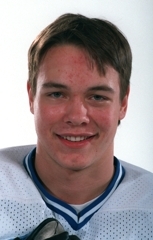 He played eight seasons of professional hockey, including 115 games in the NHL, mostly with the Toronto Maple Leafs. 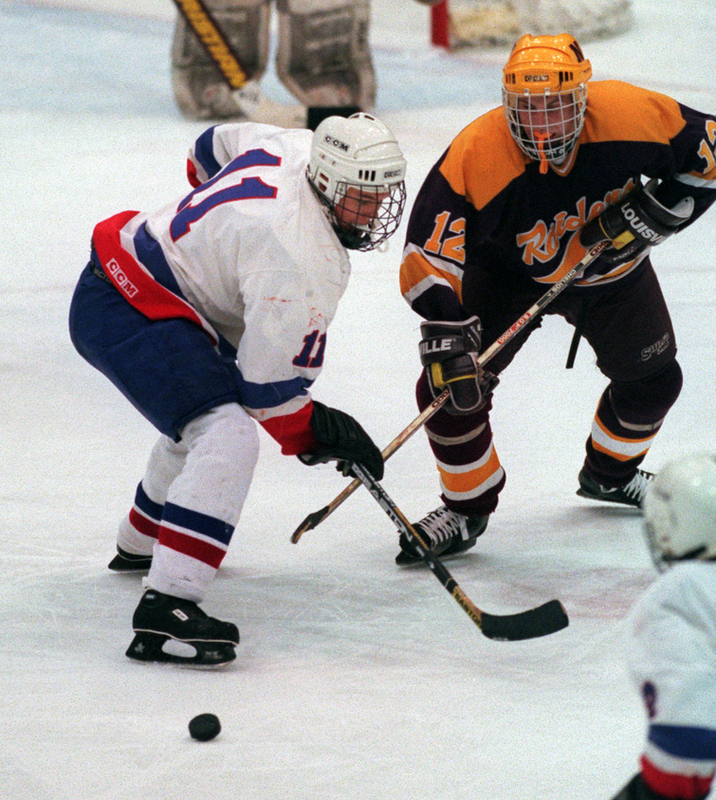 Pohl is in his first season as the girls hockey coach at Cretin-Derham Hall. His wife, former U.S. Olympic hockey star Krissy Wendell, is one of his assistant coaches with the Raiders. Pohl also teaches business education classes at Cretin-Derham Hall.